186 pages, 5.5" x 8.5"
The grim reality of the present World War expressed in the title of this book is the best explanation for the fact that it has been written . . . Accepting as hard necessity the kind of war this is, there remains for us but one course: to be tougher and more dangerous than the enemy . . . This is not a book about "self-defense." It is a book about an increasingly important aspect of war as it exists today's offensive fighting at close quarters, with and without weapons. It is a book intended to be itself a weapon: a weapon to kill enemies and to save the lives of our own men that they may kill more enemies. That is what "total war" means: that is the challenge that our soldiers must meet. 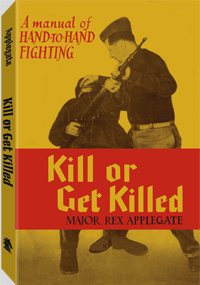 When Kill or Get Killed was first released, British Army Capt. Eric A. Sykes - veteran of the Shanghai Municipal Police and one of Applegate's earliest instructors - wrote, "It is the first book, as far as my knowledge goes, to deal with the subject on sensible lines and without doubt will replace what I can only describe and always think of as peace-time methods."